An unusual vehicle which has a 3.6 litre (30hp) V8 side valve engine, 3-speed gearbox, cable brakes and a 6 volt electrical system. 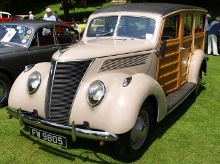 The first V8 to be built by Ford in Britain, largely to US design, these cars were popular on large estates for shooting parties. They were regarded as good performers by 1930s standards, having a top speed of over 80mph. This example was presented to the Society by the Countess of Yarborough, and underwent a comprehensive restoration from 1998 to 2005. More about the restoration, and some 'before / during' photographs can be seen here. 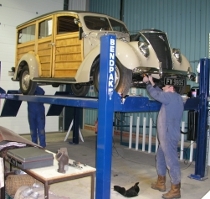 Work has begun on re-commissioning the Ford to make it ready for MOT and for use this year. Neil moved the Ford onto the ramp in early February so that it could be checked over prior to MOT. However, on moving it he found that the left hand side water pump was very noisy (the Ford V8 runs 2 water pumps -1 each side) He made a start on dismantling ready to remove the pump. This dismantling was continued the following Monday night by Alex and Paul. In order to remove the water pump (which also forms the r/h side engine mount) we had to jack the engine to take the weight off, drain the coolant and then remove the other engine side panel, the radiator grille and then the dynamo and radiator! The pump came off without issue once these were removed and is currently away being reconditioned. Whilst the Ford is apart we are also upgrading the fuel pump as it tends to drain back if the car is left standing for any period of time - the pump will be refitted once upgraded with a manual primer to allow you to manually prime the engine prior to starting which should help its ongoing starting problem. The V8 returned to the road in time for the Easter Open Day. July 2016 - The V8 continues to have electrical problems, the lights are now being rewired to reduce the load on the battery. Ultimately we may have to replace the dynamo with an alternator, more able to provide sufficient charge.